Question: What Toronto-born comic landed a six-year gig as Dr. Wayne Fiscus on St. Elsewhere? Last Question: What Bloom County character dreamed of having an interspecies relationship with Diane Sawyer? Talk about the ultimate ’80s comic strip! Bloom County ran from December 8, 1980, until August 6, 1989 – right from the very beginning of the decade until the very end. The comic was created by Berkeley Breathed. It was a political and cultural comic that took place in middle America. It featured characters such as Milo Bloom, whose grandparents ran the Bloom boarding house, where many of the stories took place; Bill the Cat, who was a parody of Garfield, and usually just said “Ack” and “Pbthhh”; and of course Opus, the large-nosed penguin. Opus was a fan-favorite, and eventually became the center of most of the stories. Breathed decided to end the strip in 1989. However, Breathed started a Sunday-only strip called Outland with original characters and situations introduced in Bloom County’s final days. However, Opus, Bill and other characters eventually reappeared and slowly took over the strip. Outland ran from September 3, 1989, to March 26, 1995. Another Sunday-only spinoff strip called Opus ran from November 23, 2003, to November 2, 2008. Question: What Bloom County character dreamed of having an interspecies relationship with Diane Sawyer? Last Question: In what movie did Sam Jones play a New York Jets football star who finds himself trying to save Earth? One of the most memorable scenes in Seth MacFarlane’s talking teddy bear movie, Ted (out June 27), involves an out-of-control house party, an irate neighbor, and — surprisingly enough — a lot of wacky hijinks with Flash Gordon star Sam Jones. The actor has made some 45 films, but that Queen-soundtracked 1980 cult sci-fi flick didn’t exactly catapult him to superstardom, and his extended Ted cameo got us wondering what he’s been up to. Quite a bit, it turns out. Jones is now mostly retired from acting, and these days the former Marine earns a living working in the personal security business, guarding high-level execs and other VIPs as they travel in high-risk areas. He works for a prominent security company that he’d prefer not to name, as well as running his own San Diego-based security business. “It’s primarily work in Mexico protecting dignitaries and executives from bad people wanting to do bad things to them,” he says. “And I love it. I absolutely love it.” Below, Jones fills us in on his weird career transformation. ENTERTAINMENT WEEKLY: Why did you move away from acting? SAM JONES: You reach a point in your career when the weeks turn into a month or more of the phone not ringing. My wife said, ‘Honey, get your a– outside and don’t come back until you have a job. [Laughs] I thought about what could I do. What I did was, one day I called a [major security] company that was known for hiring good professionals, elite guys. I said, “What do I need to do to come on board?” They said, “Look, it’s going to take you a while to do it.” They sent me to specialized training, and I excelled in that, and next thing you know I was sent to Los Angeles, protecting a billionaire. From there I was sent to [New Orleans in the wake of] Katrina to protect executives who decided to remain. I just excelled there. Hopefully this doesn’t come across as arrogant, but I know myself — we know our skill sets and our core competencies. If I was to go out and try to record an album right now, I’d be out of my mind. That’s not something I’m good at. But I know what I can do and I do it with a spirit of excellence. And running security operations in high-risk environments and making movies, I’m very good at. Anything else, I might have some issues, you know? [Laughs] It really is a high. Being in the movies and playing a couple of superheroes and characters where other people had to depend on me…this is the real deal. I feel I belong in the movie business and I belong in the security business. It’s a natural for me. You live in the San Diego area but work primarily in Mexico. How does that work? It’s Monday through Friday, unless there’s a film I’m doing [security for] or something. I wake up at 3:30 in the morning. That will give you an idea. There are times when we travel to other cities when I could be there for a couple of days, but there’s nothing like going home every day. What’s it like doing security work in Mexico right now? It seems a little scary at the moment. It can be for somebody who’s not paying attention, who’s not using common sense. It could be very scary. It’s all perception. Don’t present yourself as a soft target. When we’re in these environments where it’s the real deal, we are traveling hard. We’re in armored vehicles. They look like normal sedans or SUVs, but they are armored. And we’re traveling hard and we’re traveling fast. With that said, most of the time we’re traveling low profile. We’re not putting up red flags. There are times when we have some dignitaries when we have to travel in a huge motorcade with weapons out the windows and stuff like that. But usually we stay under the radar. In other words, we don’t give the bad guys any opportunity. They’re watching us. We’re not stupid. They’re assessing, saying, “Well let me see, if I decide to hit this motorcade or this convoy, what are my percentages of success?” When they look at us and they know our training, they can only come up with one conclusion: it’s going to be a 20 to 30 to 40 percent chance, if that. So they’re not going to mess with us. And that’s not a macho statement. It’s just in the training. It’s just how we present ourselves. What’s the scariest situation you’ve been in? We’re trained in being proactive, so if we’re driving in a motorcade and the lead vehicle is looking up ahead and he or she sees something that they do not like, we’re not going to continue forward. We’re going to make a left turn, a U-turn, a right turn. Numerous times — many, many times — we see something ahead we don’t like and we just avoid. What might you see that would make you turn around? Okay, we’re at a major intersection in Tijuana and you look around at your situational awareness and you see the taco stand, everybody is doing their behavior that they’re supposed to be doing. You’ve got a couple next to you in a car who are kissing, a couple on your left who are arguing, you have people crossing the street, normal behavior. Why is there a pickup truck parked with two people in it and they’re not talking, their heads are not moving, and why are there a couple of SUVs across the street not moving? Well, I don’t know. But I’m not going to continue. I’m going to turn around. In other words, bad guys are usually bad actors. Seriously. They don’t know how to commit to the character that they’re doing. Have you actually encountered violent situations? I can’t get into anything specific, but there are certain things that have happened, and we have had success every time. Can you describe the situation without names or places? I mean, I really can’t. Any incidents that have ever happened or been attempted, we’ve always had success. Have clients ever recognized you from your acting? Question: In what movie did Sam Jones play a New York Jets football star who finds himself trying to save Earth? Last Question: On which of the following record labels was “Thriller” released? The legendary Thriller album was released by Epic Records in 1982, and turned the music world on its head. The album won Michael Jackson a record-breaking eight Grammy Awards in 1984, including Album of the Year. That same year, Jackson won eight American Music Awards, the Special Award of Merit and three MTV Video Music Awards. Thriller was recognized as the world’s best-selling album on February 7, 1984, when it was inducted into the Guinness Book of World Records. It is one of only three albums to remain in the top ten of the Billboard 200 for a full year, and spent 37 weeks at number one out of the 80 consecutive weeks it was in the top ten. The album was also the first of three to have seven Billboard Hot 100 top ten singles, and was the only album to be the best-seller of two years (1983–1984) in the US. Welcome to the new series – Albums of the ’80s! I will try to post at least one album a week. We will go over some classic albums of the ’80s as well as some lesser known ones. We’ll have some fun remembering songs we haven’t heard in a while, and maybe we’ll hear “new” old music we missed the first time around. I hope you enjoy this. Let me know if you have any suggestions of albums you would like to know about, or if you have any favorites that you want people to hear. Unmasked was the first album (well technically cassette) that I ever owned. I got it as a present along with a tape recorder to play it on. I still have the tape, and it is still in pretty good shape – especially considering the number of times it has been played. So, my first album came at a transitional period for Kiss. 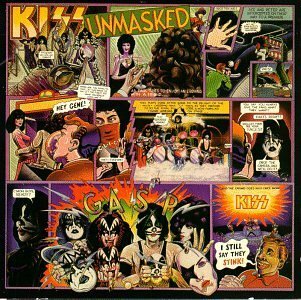 Unmasked was the last studio album to feature the original lineup of Paul Stanley, Gene Simmons, Ace Frehley and Peter Criss until the band reunited. Peter Criss technically was not even involved with the album. Anton Fig played drums on all the tracks, and was uncredited for it. After the album came out, Eric Carr would go on to be the permanent drummer for Kiss, until his death in 1991. Although the album was titled Unmasked, this is not when the band did away with their makeup. The cover art was actually a comic strip. It featured a goofy photographer trying to catch the band members without their makeup on. Finally, Ace told him that if he dropped the camera they would take their masks off. They took their masks off, only to reveal that they had their makeup on underneath. Since I had this on cassette, I would read the comic with a magnifying glass! The album started out wi a bang. Or actually a Paul Stanley scream. This Paul Stanley song is probably the hardest rocking song on the album. A great way to start. Another Paul Stanley song. This time a ballad. This song was a hit in several countries. It peaked at #47 in the U.S., but reached all the way to #5 on the Australian charts. I love this Ace Frehley song. The song was not released as a single in the U.S., but was released in several other countries where it reached the top-10. Hehe. He said “Naked”. As a ten year old, that was awesome! Of course, the Naked City, in this Gene Simmons song, refers to New York, and not a city where people are actually walking around naked. But it’s a pretty cool, if not depressing, song. There were 3 songs on this album that I played over-and-over again. And this Paul Stanley tune was one of them. Warning: This song could possibly give you an earworm! Not a bad song to have stuck in your head though. This is song #2 that I played over-and-over. This is another great Paul Stanley song. I really like the guitar solo as well. I like this Ace Frehley song a lot. If you liked “Talk To Me” earlier in this album, then you’ll like this one. Back to Gene Simmons. Not a bad song. Not exactly the best song on the album, but still good. The last of the Paul Stanley songs. It’s probably my least favorite Stanley song on the album, but it’s still not bad. Ugh. This Ace Frehley song is somewhere around 3 1/2 minutes, and I think he repeats the title of the song for the last 2 1/2 minutes. The song after this was one of my favorites so I would always try skipping by this one. But since they repeat the same thing over and over and over again, I could never tell when it was almost over. Then I would skip too far, and have to rewind, and keep going back and forth. All you guys that used to listen to cassettes know what I’m talking about. Eeesh, It would have been faster to just listen to the whole song. This Gene Simmons song was one of my favorites. Great way to close out the album.